Environmental Protection Agency Administrator Scott Pruitt has managed to stay alive in Washington, despite a laundry list of scandals and allegations of taxpayer abuse and improprieties. Republican lawmakers shrug off the scandals as unhelpful and distracting, but by and large support the policies that Pruitt is implementing at the EPA. President Donald Trump has maintained a positive view of Pruitt, despite constant negative press from the growing list of scandals. 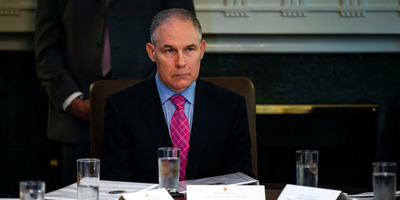 WASHINGTON – Environmental Protection Agency Administrator Scott Pruitt has managed to stay at the helm of the agency tasked with massive deregulation under the Trump presidency despite a never-ending onslaught of scandals, allegations of improprieties, and just plain unflattering headlines. While it initially seemed inevitable that Republicans would pressure Pruitt to resign or President Donald Trump would fire him, that day has not come, and why that is so is anyone’s guess. Pruitt has faced a wide range of scandals since taking the reins at the EPA, including lavish spending and overuse of a security detail, a $US50 per night condo owned by the wife of a lobbyist, attempting to secure a Chick-fil-A franchise for his wife on the taxpayers’ dime, getting his wife a job with a nonprofit group whose conference he spoke at, treating the White House cafeteria as his “personal dining hall,” and more. The pile of scandals have even prompted Democrats to request that the FBI open a criminal probe of Pruitt. And the trove of scandals don’t even tell the whole story. The leaks from his office are a near-daily occurrence. Some of them even appear to be attempts to make him look like a fool, such as claims he makes staffers grab him snacks in the middle of the work day, a task that many members of Congress send to their own staffers on occasion. By and large, Republicans still hold a positive view of Pruitt, while others just try to pretend his scandals do not exist. Discussions with most Republican senators, all of whom except Sens. Susan Collins and John McCain voted to confirm Pruitt (McCain was not present for the vote), yield a typical response that it is at the discretion of the president as to whether the embattled EPA chief stays in his role. They call Pruitt’s scandals a distraction and unhelpful, but stop short of calling for his resignation. For lawmakers who could influence Pruitt’s future, it boils down to two things: Republicans overwhelmingly support the policies Pruitt is implementing and they do not want to upset Trump, who ultimately holds Pruitt’s future in his hands. Republicans are the same in private as they are in public on this issue, a rarity in Washington. Cornyn’s opinion that it is only Trump’s choice, while true, is representative of how most Republicans feel. In speaking out against a scandal-ridden EPA administrator, they would essentially be speaking out against the president, which runs the risk of falling into Trump’s crosshairs – somewhere no Republican wants to be. Republican Sen. James Inhofe, a longtime ally of Pruitt in their home state of Oklahoma, is close to a breaking point with the growing stack of scandals. While Inhofe said he was not yet calling for Pruitt to step down, the pressure only increases as things get worse. And conservative media outlets, which have spend much of the Trump presidency singing Pruitt’s praises, have instead started turning on him. The Weekly Standard, another conservative magazine, called for Pruitt to step down in an editorial last month. Basically, Pruitt’s work is not a hot-button issue with voters but is policy that Republicans absolutely love. Most voters do not place environmental issues high on the totem pole, and Pruitt’s scandals are a drop in the bucket in the grand scheme, where members of Congress are resigning left and right over various damaging reports. When Pruitt starts to cause headaches for vulnerable Republicans running for re-election, or when he starts to really make Trump angry, then he will be booted. But until then, he is managing to stay afloat in an increasingly deeper swamp.